High Quality Content by WIKIPEDIA articles! 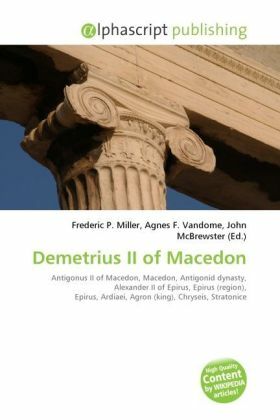 Demetrius II Aetolicus son of Antigonus Gonatas, reigned as king of Macedonia from the winter of 239 to 229 BC. He belonged to the Antigonid dynasty and was born in 275 BC. There is a possibility that his father had already elevated to him to position of power equal to his own before his death. If this had occurred it would be dated at 256 or 257 BC. He had already during his father's lifetime distinguished himself by defeating Alexander II of Epirus at Derdia and so saving Macedonia (circa 260 BC). On his accession he had to face a coalition which the two great leagues, usually rivals, the Aetolian and Achaean, formed against the Macedonian power. He succeeded in dealing this coalition severe blows, wresting Boeotia from their alliance. The revolution in Epirus, which substituted a republican league for the monarchy, gravely weakened his position. During his reign his kingdom extended to Euboea, Magnesia, Thessaly and its environs, excluding Dolopia and possibly Peparethos and Phthiotic Achaia. At 236 BC he invaded Boetia, making the Boetians submit immediately.